San Jose, CA – June 19, 2017 – Angie Hospitality, creator of Angie, a revolutionary voice-based hotel guest room technology solution, will be competing in the Entrepreneur 20X (E20X) competition, taking place during day one of HITEC Toronto on June 26 from 1 p.m. to 4 p.m. at the Metro Toronto Convention Centre. Angie Hospitality is one of 13 start-up contenders and will be pitching its innovative voice command solution with a four-minute presentation detailing Angie’s key features, as well as her significant impact on guest communications and back-of-house operation protocol for the hospitality industry. The E20X competition features two eligible awards – the Judges’ Award and the People’s Startup Award. The Judges’ Award is given to the start-up deemed most innovative and is chosen directly by the judging panel, with a trophy and grand prize of $5,000. The E20X People’s Startup Award, also known as the crowd favorite, is chosen specifically by the conference attendees via the HITEC app. 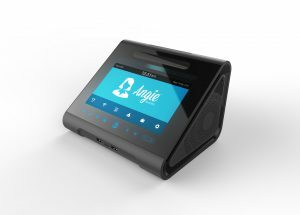 Angie Hospitality officially announced its cloud-powered, interactive guest room assistant in April of this year. The enterprise-class solution is purpose-built specifically to meet the needs of the hospitality industry. Some of Angie’s key solutions include acting as a secure in-room Wi-Fi access point, serving as a 24-hour guest room assistant, offering convenient room control over things like lights and temperature, replacing the telephone, supplying a high-fidelity Bluetooth speaker and providing guest and group promotions through her interactive touch-screen. Angie is currently being implemented at multiple hotel properties in the U.S. and will be available for general distribution in North America and Europe in Q3 2017. For more information on Angie’s full range of features or to schedule a time to visit the Angie Hospitality team during HITEC in the E20X Pavilion, please contact Dina Magdovitz at Dina@planapr.com. You may also visit www.angie.ai for more information. About Angie Hospitality | Angie Hospitality, led by industry veterans, designs and develops the only voice-activated, Wi-Fi and room control technology solutions built just for hotels and resorts. Angie, the 2017 HTNG TechOvation Winner, is the world’s first cloud-managed, enterprise-class voice- and touch screen-based guest room assistant and integrated room control device. Angie delights hoteliers and guests with a highly intuitive multi-lingual voice interface that responds to guest and staff requests; integrates with guest room lighting, thermostat and televisions; interacts with room service, housekeeping, maintenance and the front desk and even acts as an energy management system. Angie can replace the hallway Wi-Fi access points, guestroom telephones and alarm clocks and has the ability to remember guest preferences if they choose. Angie makes all guest rooms, smart rooms by driving increased operational efficiencies, revenue and guest satisfaction. With headquarters in Silicon Valley and London, Angie Hospitality currently offers service in North America and Europe, expanding soon to Asia Pacific and the Middle East. For more information on Angie Hospitality, please visit www.angie.ai and connect with us on our social media channels – Facebook, Instagram, Twitter and YouTube.